Looking westwards through the gap between the 'Sailor's Return' and 'The Ancient Mariner' public houses, one is met by the mellow yellow sandstone buildings of Joseph Pirt's engineering works, blending nicely with the yellow grime-encrusted brickwork of the railway viaduct: gateway to the Marsh and Quay. The corner of 'The Queen's Head' can just be made out in front of the deflated gasometer between Stanley Street and the harbour side, with what was the old blacksmith's shop at the end of Whitfield buildings (now - bizarrely - renamed Lawrence Street, complete with newly-built houses) behind it. Progressing westwards past the old Seaman's Institute to the corner of Marsh street and the harbour-side, the buildings which were Wilfrid Marley's still stand, but in disrepair. On the other side of Marsh Street are the old Bonded Warehouses, used latterly as a ball-bearing distribution centre. Dwarfing all previously described is the tragically short-lived Chapel Bank Induction Furnace plant, erected, tested and demolished without even being commissioned and oficially opened. At the time of the photograph, this mighty and power-hungry appendage to the iron foundry was being dismantled piece-by-piece. 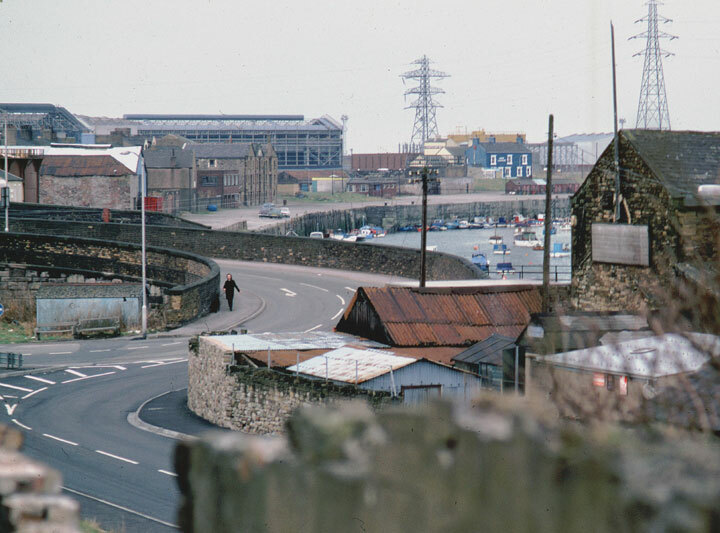 Between the Bonded Warehouse and the buttressed red-brick electricity substation - built to link Chapel Bank to Willowholme Power-Station, Carlisle - can be seen McCall's 'BP' filling station and the single-level offices of the Workington Harbour and Dock Board, at the western end of Stanley Street. The tin roof and burned-out hulk of Tolson's garage can be picked out behind - a favourite ratching place as a boy! On the wider part of the harbour side sits the little row of fishermen's buildings: small and cottage-like, used to house nets, floats, lobster-pots etc. A drink was still to be had at both 'Jubal's' ('The Ship Launch') and 'The Coastguard' public houses, visible here between the harbour's end and the electric overhead crane on the site of Williamson's Shipyard.